Since I don’t move enough, I have to add exercise to the mix. Especially in the winter, when the cold and the dark and the ice make it tough to fit all the movement in, I exercise. And I pick my exercises with the goal of improving the capabilities—mobility (especially), strength, control and access to appropriate movement patterns—that I found were limiting factors last summer. This last—access to movement patterns—is new. I’m just coming to realize that in many cases my limitations are not (or not entirely) a lack of strength or flexibility, but rather are due to poor patterning of the movement. More on that below. I stuck with the exercises I’ve been focusing on for three years now, and added a couple. I finally made real progress in squatting, and it turned out to be a really simple thing that made the difference—and probably a movement pattern thing. In one of the classes I took with Ashley Price, she had us find the best squat we could do with perfect form. That is, we got in neutral posture with our feet hip width apart, our feet pointing straight forward, our femurs neutral, and then we squatted down only as far as we could go while keeping our shins vertical. Basically, I’m happy with my progress on squatting. Here I’m finally making great progress—chin-up! Other than that I’m pretty much doing what I’ve been doing—negative pull-ups. Sometimes I do them for volume (I’ve done as much as 3 sets of 7, or 2 sets of 8 plus a few). Other times I’ve been doing many fewer sets and reps, concentrating instead on doing them very slowly. Just since doing my chin-up I’ve begun to recognize a movement pattern issue here as well. Based on how sore my traps were after my first chin-up, while my lats weren’t sore at all, I think I’m failing to initiate the pull with my lats. I’m addressing that two ways. First, I’m doing the negative pull-ups very slowly, trying to find the point where I transition to using my lats and emphasize that part of the move. Second, I’m trying to specifically engage the lats by pulling my shoulders back and down before trying to pull myself up. Besides all that I’m sticking with my other hanging exercises—swinging side-to-side and back-to-front, leg raises, knee-ups, and I’ve added some twisting knee-ups as well, turning my hips to alternate sides and raising my knees toward my elbow on that side. I’m also ready to start doing some traversals along the bar. I haven’t made much progress here, for much the same reasons as last year: wall dips are hard, and I’ve been working on various progressions instead. I play around with bench dips and (rather shallow) parallel bar dips and wall supports. Another reason I’m not making much progress here is that for my main pushing exercise I’ve been emphasizing pushups. I’m reasonably pleased with my progress on toe flexibility as well, even though I haven’t actually increased my range of motion much. What I’ve done is improve my ankle dorsiflexion enough that I’ve been able to start doing the things I couldn’t do because of limited toe flexibility. There’s a particular move I wanted to be able to do, that involved shifting from a squat to a deep knee bend, then lowering the knees to the ground and then kneeling. It can also be reversed by flexing the ankles to tuck the toes under, rocking back to get into a deep knee bend, and then shifting to a squat for standing back up. Among other things, this is a martial arts move: You can move from kneeling to standing while keeping your hands free to block an attack (or prepare to launch one). I can sorta do that now. Not smoothly, and not without an amount of toe stretching that feels a bit excessive, but vastly better than two years ago where a single attempt hurt my knees and toes enough that it took weeks to recover. Now that I can do 8 pushups it’s about time to start doing multiple sets—maybe starting with 2 sets of 5? I’ll try that in a couple of days. I don’t have long-term plans to emphasize pushups though. I’ll keep doing them, but once I can do a couple of sets of pushups and still have some strength left in my triceps, I’ll get back to work on the various sorts of dips. This year I added kettlebell swings to my exercise regimen. I want to talk about this a bit, because there’s a story here. About a year and a half ago I was out on a very long walk with Jackie. Toward the end we sat down on some concrete benches for a short rest, and I found that there was an uncomfortable lump right behind where I was sitting. Shifting around to find a lumpless spot was not successful. 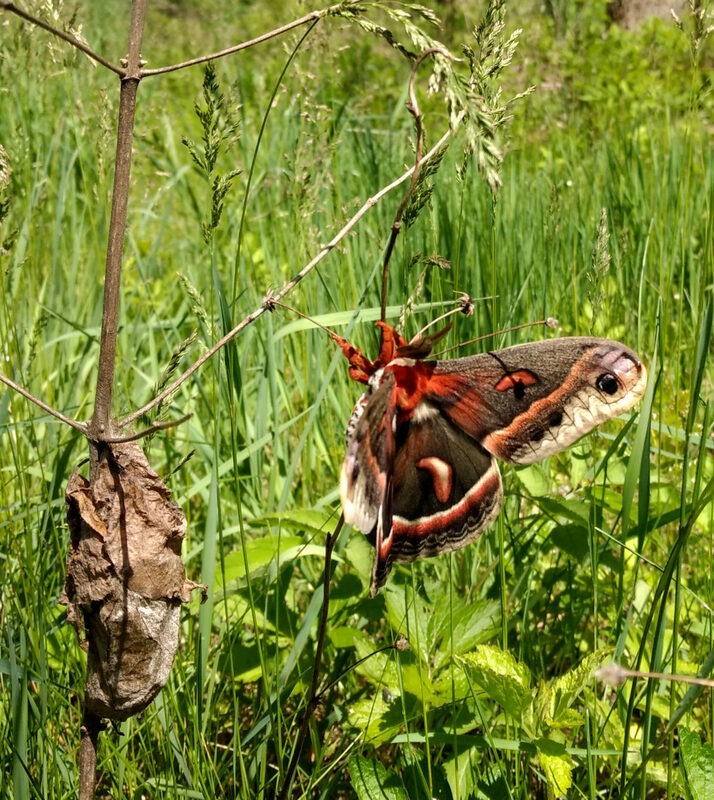 Eventually I figured it out: I had lost enough weight that I no longer had enough cushioning to keep my tailbone up off the bench; the lump I felt was my coccyx. Figuring that bigger glutes would be a better choice for keeping my coccyx up off the bench than fat anyway, I started boosting the weight I used in my goblet squats. Then I remembered an old post by Tim Ferris that recommended kettlebell swings as the best glute exercise. Then some anonymous kind soul donated a 45 lb kettlebell to the Winfield Village fitness room. Looking at my training log, it appears that I started doing kettlebell swings in January, and worked up to 3 sets of 25 by April. As Tim had recommended 75 reps as a target, I’ve left it there. I don’t have data on the size of my glutes, but I’m no longer bothered when I sit on a hard bench. I use the kettlebell swings as my high-intensity interval training as well. A set of 25 swings spikes my heart rate up right toward my max heart rate. (I’ve actually seen heart rates above my estimated max heart rate, which just means that the estimate is a bit off.) Each set takes about 50 seconds, and I follow it with as much rest as I need to get my heart rate back down around 100, which works out to two or three minutes. I’ve toyed with the idea of adding a fourth set, and might yet do that. My main non-exercise movement is and always has been walking. It was a bit limited in the second half of this year because I hurt my feet, and one foot in particular has taken a long time to recover. I think what happened was this: I was waiting for the bus, which unbeknownst to me had been rerouted due to road construction. Seeing the bus zip past a block away, I took off running to try to catch it at the next stop. In the rush I think I must have fallen into an old heel-strike movement pattern, bruising my heels, resulting in this nagging foot pain. Only in the last few days of the year does it seem to finally be completely resolved. I expect my walking quantity to return to its old baseline quantities in the new year. Running was also curtailed by my foot injury. Before I hurt my foot I had been increasing my running distances as well, working my way up to where I did an 8-mile run for the first time in many years. 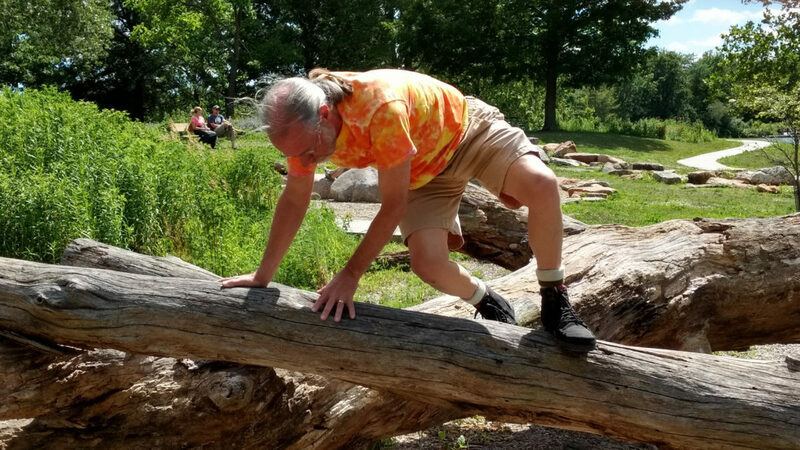 I did spend a little time with the campus parkour club, but once again timidity (both movement timidity and social timidity) kept me from doing as much as I might have. Each summer I mean to step this up. Maybe 2018 will be the year. For most of the year I teach two taiji classes—a beginners class that meets for an hour twice a week, and a group practice for continuing students (we don’t consider ourselves “advanced”) that meets for an hour three times a week. Besides that I do some taiji and qigong throughout most days. I do some qigong to loosen up in the morning. I do some before lifting to warm up, and then I do some between sets as “active recovery.” I might do a whole short form when I feel like a little moving mediation would do me some good, or even a whole long form when I feel like a lot of moving meditation would do me some good. Basically, I do a lot of taiji. Even when I’m not teaching I include it as part of my daily movement, simply because it has proven itself such a powerful tool for helping me move and feel better. Over the summer I got back together with my friends who practice push hands a few times, but we were never able to get a regular thing going, which is very sad. I’ll try again next summer. These are perfect examples of non-exercise movement: We don’t do them for the exercise (although we get plenty); we do them to improve the land. I have had some success in getting my mind right with the cold, this year in particular, but also gradually over the past several years. I’m getting in more outdoor exercise this year than last, and a lot more than I did five or ten years ago. That, plus the indoor strength training and the taiji, look to stand me in good stead for getting 2018 off to a good start. We’re planning a spring trip to some national parks in southern Utah which will entail a good bit of walking, so we have that bit of extra motivation to keep up with our walking over the winter. Recovering the ability to move well after decades spent sitting still is hard. I’ve spent years working on it, making fitful progress—walking more, running (when I managed not to injure myself), riding my bicycle, lifting weights, doing taiji, etc. I feel better than I have since I was much younger, and I move with more flexibility, mobility, power, and control. I am very pleased with my progress, especially these past three years since I went down the rabbit hole of natural movement, but it was a hard trip. The internet is a help—there are many, many videos of movement gurus demonstrating how to move well, and many pages with advice, corrections, and exercises for getting from here to there. One good place to start is with Katy Bowman, whose eight books and thousands of blog posts provide step-by-step instructions on recovering the ability to move well (and much else besides). But as I say, it’s hard to do without local support, and until the last few weeks my efforts had just one source of local support—my taiji instructor and community of fellow students (now my students). So I am delighted that we now have one of Katy Bowman’s students teaching here in Champaign-Urbana: Restorative Exercise Specialist Ashley Price. I’ve taken several of her classes and can assure you that she knows her stuff and knows how to teach it. I gather that her special interests are things like diastasis recti, pelvic floor dysfunction (and pelvic function in general), which are potentially issues for everyone, but especially pregnant and postpartum women, but she also teaches the full range: foot function (did you know that your foot contains 26 bones and 33 joints? ), squatting, neutral posture, core function, shoulder mobility, etc. Getting this sort of local support earlier would have helped me a lot. Although most of the work of recovering the ability to move better comes in the form of time spent moving, it’s easy to exacerbate problems rather than improve things when you start to move more. I’ve certainly limited my own progress many times by trying to up the intensity when I should have been becoming more grounded in the basics, or simply by practicing moving incorrectly. Taiji is an excellent movement practice, being as it is about having an intention to move in a particular way, and then paying attention to whether or not you are executing your intention. But its roots in martial arts give it a particular focus, and it does not serve all areas of movement equally well. The first time I tweeted something about Katy Bowman, one of her senior students tweeted back, welcoming me to the fold. I said something like, “I’m just working my way through the archives of her old posts,” to which Petra Fisher responded, “That’s how it starts.” I have to admit that she was right. If you want to learn to move better, and you’re local to the Champaign-Urbana area, I recommend Ashley Price highly. It caught my interest in particular because I’d been mentally composing a post about how I just turned 58, but I’m not suffering the aches and pains that supposedly go along with getting old. My friend’s post reminded me that referring to this as “feeling young” is problematic. And yet, I find that I come down on the other side of this issue. Sure, there is a certain irrefutable accuracy to say that your age is the current year minus your birth year, but age is many things besides a mathematical calculation—at a minimum it’s a social construction, and also perhaps a collection of biological circumstances. It’s true that what I mean—and what perhaps I should say—is I feel good. Better, in fact, than I’ve felt in years. I’m stronger, more flexible, and more agile than I’ve been in longer than I can remember. I move with more ease, more power, and more control. I have more endurance. I’m certainly more comfortable in my own skin. A lot of this is just good luck, of course—good genes, avoiding serious injuries and serious illnesses so far. Beyond good luck I credit my movement practice for most of the rest. Taiji. Walking and hiking. Running (merely an adjunct, but one I enjoy in particular). After years of lifting with machines to little noticeable effect I now do almost all my strength training with bodyweight exercises and am having much more success. (The main exception to pure bodyweight exercise is doing kettlebell swings for my high-intensity interval training, which I ought to write about because it seems to be doing some good, and is also quick and fun.) Push hands I wrote about recently. Animal movement ditto. So new I haven’t had a chance to write much about it yet, I did yoga for the first time last week. But to bring this back full circle, I’m not so sure that it’s wrong to talk about “feeling young.” My friend is right—growing old is a privilege not everyone enjoys. It is indeed better than the alternative: dying young. But just as I can see her objections to denying age (as if refusing to acknowledge it meant something), I object to denying one’s felt experience. If someone says that they “feel young,” does an appeal to mere arithmetic justify correcting them? Certainly I am not the only person to feel this way. There are always people trying to express health and fitness in terms of age. There are websites that will suggest a guess as to your physiological age vaguely based on your weight and your activity level. Various practitioners of various disciplines will measure specific things ranging from your maximum heart rate to the length of your telomeres and use the results to calculate a biological age. They’re all pretty dubious, but I find that I do not object in principle to thinking and talking about concepts like health, fitness, and vitality in terms of age. Even though there are many unhealthy young people and many old people who are fit and vital, I think the notion resonates in a useful way. As for me, I feel good. I also feel younger than I’ve felt in years. My most recent addition to my movement practice, just started, is animal movements. These are basically just ground exercises where the shapes are inspired by animal movements: Bear and Crab crawls, Ape and Duck walks, transitions from one to another. 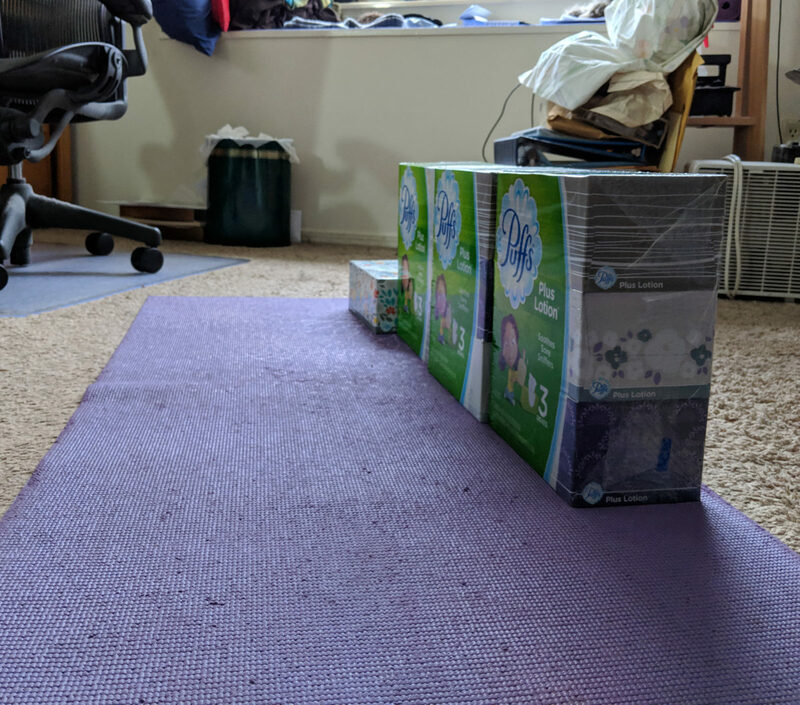 My hope is that doing them will help me connect some of my mobility practice with movement (as opposed to static stretches). My hip mobility and my toe and ankle dorsiflection are limited enough that I can’t do certain things that I’d like to do—in particular a deep squat, but also a particular kneeling-to-standing transition. Probably other things I can’t think of at the moment. For three years I’ve been working on these aspects of flexibility/mobility and I’m making progress, but I’m not there yet. I’m not sure what it will take to get there, but one possibility that comes to mind is that I haven’t tried to connect these things with other movements. I’ve done isolated stretches, and I’ve done assisted/bolstered versions of the movements, but I haven’t tried to use the movements as part of a sequence of other movements. Very possibly my difficulty is not merely my muscles being “too tight,” but rather springs from a the lack of a proper mind-body connection linking these moves and other moves I do. My hope is that the animal forms, by giving me an opportunity to pass through these postures (rather than merely trying to hold them as static stretches) may help make the mind-body connection in a way that lets me relax into the postures quicker than just more stretching would do. 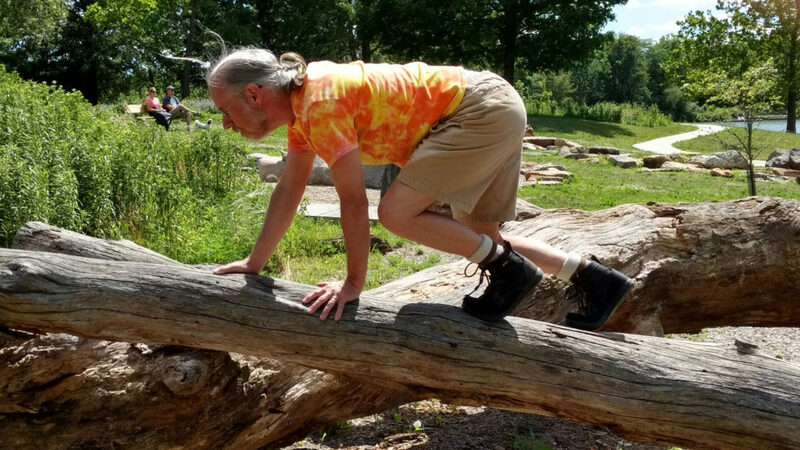 In any case, I’ve been meaning for a long time to increase the amount of ground exercises I do and not getting around to it, and animal movements—by giving me a framework for that—have finally gotten me started. I don’t think I’m going to stick with the animal forms for long. There are plenty of natural human ground movements which are largely similar, but some of the animal forms modify them to justify the name, and although that can be fun, my own affinity is always going to be for natural human movement. Once I’ve established the habit I’ll look to transition away from animal forms and just do combos of human-style crawling, rolling, sitting, squatting, kneeling—and the transitions between them.